Being hopeful: UN climate chief Yvo de Boer said on Friday talks on emission cuts were moving ahead. 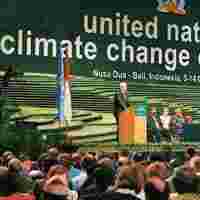 Nusa Dua: United Nations climate chief Yvo de Boer said late Friday evening that a conference on tackling Earth’s global warming crisis was on the verge of a deal on how to reduce greenhouse gas emissions among rich nations. When asked how he assessed the state of talks, he said: “On the brink of agreement, I think—absolutely not deadlocked." “People are working hard to resolve outstanding issues," he added. It couldn’t immediately be ascertained Friday night (India time) whether an agreement would be reached later the same night. The conference is designed to set a framework for action on fighting global warming after the Kyoto Protocol’s commitments end in 2012. De Boer said that all sides were working to avoid creating an “unborn Kyoto Two" that still does not include the US. Earlier, negotiators agreed to US demands, dropping specific targets on greenhouse gas emissions from the draft in an effort to salvage the agreement which will guide discussions on a global warming treaty over the next two years. The US, the only developed nation to reject Kyoto, has led resistance to EU-led calls for the text of the Bali agreement to set an “ambition" whereby industrialized countries would slash 25-40% of emissions by 2020 compared with 1990 levels. The US’ stand is based on the argument that the talks should first focus on ways to reduce emissions banned for climate change, and then discuss specific targets. Meanwhile, Friday’s negotiations included threats of unspecified trade sanctions against developing nations that didn’t agree to richer countries demands, said the group of 77 developing nations (G-77) and China. “I did hear trade sanctions mentioned," said Munir Akram, a Pakistan ambassador and spokesman for the group. “These are things that are said in the course of negotiations. What’s in the heart and the mind comes to the tongue," he added. Late on Friday evening, UN secretary general Ban Ki-moon said he would return to Bali on Saturday to attend the global climate talks, which were deadlocked late Friday, several hours after running beyond their deadline. “I will go back ...to meet with the delegations...and engage myself in continuing further negotiations," he added. “Climate change is an issue that affects the future of all humanity," said Ban, who hoped that delegates would come to an agreement by themselves later Friday. Alex Morales and Kim Chipman of Bloomberg contributed to this report.